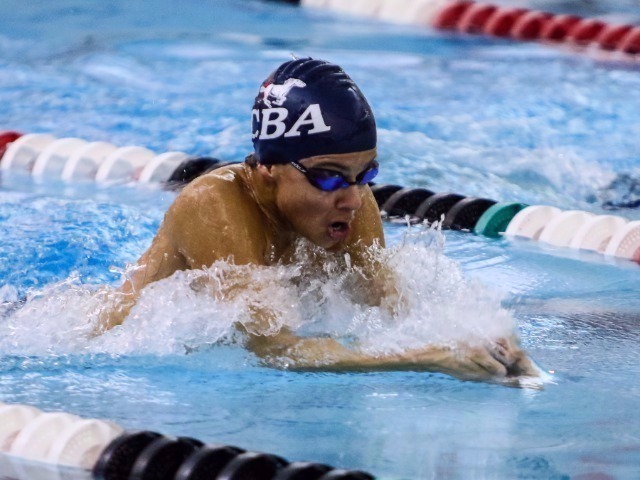 The Christian Brothers Academy swim team opened their new campaign on Tuesday evening and the first victory was a special one for their head coach. The 102-68 win over Marlboro was head coach Vito Chiaravalloti's 100th career victory with the Colts. Christian Brothers won seven events en route to the win on Tuesday night. Tom Shea took the 200 freestyle, Liam Morris won the 200 IM, Sam Rennard was first in the 100 freestyle, and Kevin Truscio took the 500 freestyle. The Colts also won the 200 freestyle relay, 100 backstroke, and the 400 freestyle relay. Chiaravalloti took the reigns in 2008, after the retirement of the team's first and only head coach, Mike Sullivan. Chiaravalloti has won seven state championships and nine Shore Conference titles as the Colts' head man. He was a standout swimmer on CBA's first-ever state championship team in 1998, graduating from the Academy in 1999. "I am blessed to have been a part of some great teams and to have had some incredible young men swim for me," Chiaravalloti said. "The swimmers deserve all the credit, they did all the hard work." The Colts are the favorite to win the Non-Public State Championship for the ninth time this season. In 2017, CBA won their 26th Shore Conference Championship, but fell just short in the state title meet. Chiaravalloti has stacked the Colts' schedule to prepare for their state title run, swimming against prep school power, Peddie, this upcoming weekend. CBA will also face LaSalle College High School from Pennsylvania and Westfield High School in December, both state champions in their divisions. Follow the Colts season on Twitter and Instagram, @CBASwimming.